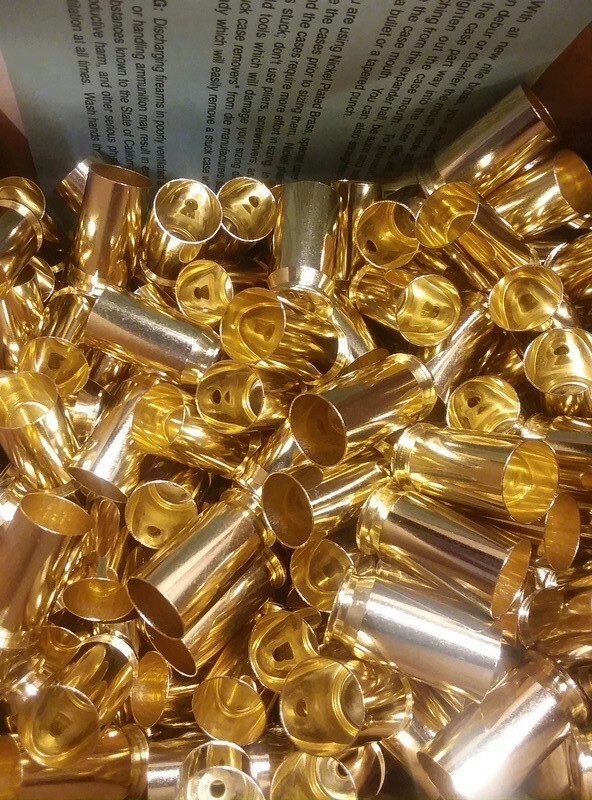 SOME HOW I FOUND MIDWAY USA SELLING NEW .45 ACP BRASS FOR $48.49 PER 500 PIECES. ALL THE SEARCHING I DID THE CONSENSUSES WAS THAT THE BRASS WAS MADE BY STARLINE. JIMPGOV wrote: SOME HOW I FOUND MIDWAY USA SELLING NEW .45 ACP BRASS FOR $48.49 PER 500 PIECES. ALL THE SEARCHING I DID THE CONSENSUSES WAS THAT THE BRASS WAS MADE BY STARLINE. Considering Midway used the exact same file photo for their Starline brass and this brass, I'd say it's a pretty safe bet it's made by Starline. Like you said "Too cheap to pass up". Darn, the credit card takes another hit. Likely remnants of the closure of HPR Ammo last year. Snap it up while you can. Who knows who really made it. I have more brass than I need but just can't pass up a good deal, well Merry Christmas to me I guess. When HPR first started out they used Starline brass so chances are pretty good they got starline to make their branded stuff. I got my order in today already but didn't check primer pocket size. Will do that tomorrow. That went quick, just sold out! sold out no more available. I guess it doesn't matter now, but yes, its all large primer pocket brass. This brass averaged about 0.002" shorter and .025gr heavier than my new Starline brass. It's very consistent, actually from the sample of 50 I measured it was just a touch more consistent than the Starline. I did not measure internal capacity. I don't have any new Starline +P brass but I wonder if this brass is closer to the +P specs?? DavidR wrote: sold out no more available. Try again. I was just able put some in my cart, not sure if they found more as I didn't go all the way through check out. Took a look at the brass I received and it's not starline. Primer hole is made differently and rim is larger. Maybe top brass? Midway should sponsor this forum. jglenn21 wrote: Took a look at the brass I received and it's not starline. Primer hole is made differently and rim is larger. Maybe top brass? I thought the same thing, but it was pointed out to me Starline may not use their dies when producing brass with other headstamps. So it could have been made by them. Doesn't really matter, the brass is different but VERY consistent. Mine arrived yesterday. Very Nice! Have camera will travel. Paladin.. oh, does that age me? I thought the link went to nickeled brass, did midway change the pic? The photo does look like nickel plated due to the lighting used, but no, it's brass.